Hello, I joined this group today. 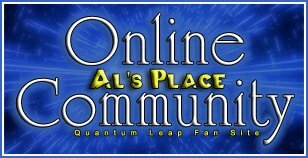 I live in East Tennessee and was looking to find other fellow Quantum Leap fans. I hope everyone is well. Always happy to meet new members. Pull up a bar-stool, the first schooner's on me! Sorry for the lateness but welcome to Al's place. It's been quiet around here so we're always glad to see new contributors.